Jennifer Yu Heung Yi, Tony Wu Tsz Tung and director Sunny Chan Wing Sun yesterday attended an descriptive video service new milestone and MEN ON DRAGON (YIK LAU DAI SHOOK) film appreciation event as the blind enjoyed the film. Yu Heung Yi has already seen the film twice. Earlier when she watched with the cast, the atmosphere was great but she missed the end credit Easter Egg. This time she had to see it as she did not want to miss the exciting footage. Wu Tsz Tung praised that the one minute end credit Easter Egg was worth watching, as they were outtakes from their dragon boat rowing. He joked that they could catch those who were slacking off. He also said that while working on the movie on the Shing Mun River in Shatin, he saw a lot of garbage and swimming organisms. He was greeted with toilet paper and a lot of dissolving brown stuff. The luckiest was that he did not have to get into the water. Ken Wong Tak Bun had to get into the water around Shek Mun, where the water quality was better. 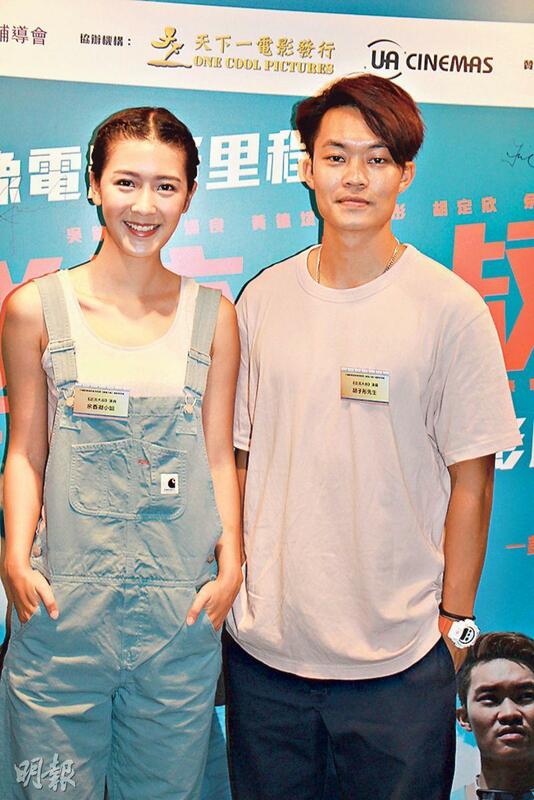 He also said, "Girlfriend (Stephanie) Au Hoi Shun has already seen the movie and praised how entertaining it was. I am more demanding, as I feel my performance isn't good enough. After watching the film I was a little upset, I saw a lot of flaws. Because the entire team contributed so much, I could do a little better. However actors had to face a lot of impact. Although the director and the producer felt that my performance was decent, I felt that I could improve more." Yu Heung Yi comforted Tsz Tung and said that his performance was not too bad because comedy was very hard. Tsz Tung however was able to grasp the pace and was a great actor. Yu Heung Yi also felt that she could improve more. She said that in the film she played the coach and the dragon boat drummer, she had to be noisy all the time and was afraid of upsetting everyone. However fans told her that she sounded great, however she would have been annoying.